Yiwu Night market is placed in Santing Road, in the Binwang Shang Mao Qu area, near Yiwu Binwang Market. The total lenth of this road is 800 meters, not very long, Now it is becoming the busiest street at night in Yiwu. It is begin at 6:10pm in Summer and in Winter it will be earlier. When it is the time, the administrator will blow the whistle, and the booth owner begin to set their booth. There are many commodities, children clothes, socks, belts, shoes, plastics, toys, lady and men's fasion, and baggages, boxes, and also the very famous is the tattoo, there are many booths for tattoo and nail dressing too, there are also many snacks. Also services like street tailors, nail shops and tattoo parlors are dispersed throughout.The quality level is also middle level , suit most customers. Yiwu night market attracts a large number of both Chinese and foreigners.As for the stuffs there are really cheap. And also you can find something really worthy there, sometimes. Every night, several streets of the market are crowded with people, it's really busy. So when you are doing shopping there, we should take care of our pocket or bag! As more and more visitors are asking me questions about Yiwu night market, so I went to the market for the first time to explore by myself. Sorry, I don't have a hobby for night market. What can I buy from Yiwu night market? Oh, yes. Lots of fake brands: Nike, addidas, Puma, D&G… I can just number these I saw, but I'm sure there are far more than this. These logos are printed on all kinds of things: bags, clothes, shoes, sun glasses, belts, watches… even on bras and shorts. So if you're after babies sleep, then go to this night market. Theses around 700 shops won't let you down. 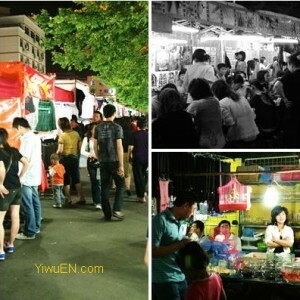 When does Yiwu night market open?